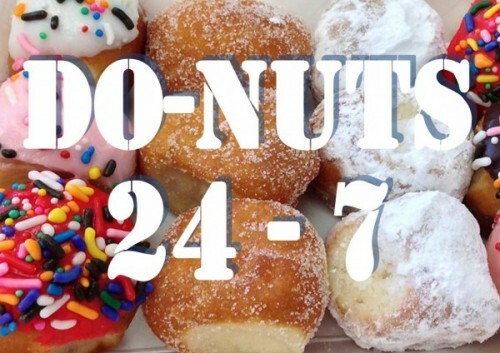 Just in case you’re looking for a good reason indulge in something sweet, we’ve put together a list of why 24 hour donut shops really rock our world. Need to stay up? Sugar can wake your brain up. Sugar has proven to be a great way to stay awake and alert when you need it. Whether you have final exams coming up or a career-changing proposal due in the morning, the sugar in donuts will help you stay awake and get ready for the big event. It’s relaxing. Sitting down with a fresh donut is a great way to relax after a very long day of work. (If you’re getting off work between the hours of 10PM – 5AM, chances are you’re beat! Sit down and relax. You deserve a donut.) You work hard. Maybe you don’t want a meal after a long shift, but taking time to sit and enjoy a donut can help your mind relax enough to get a good night’s sleep. Coffee and donuts make the perfect combination, no matter what hour of the day. Can we say comfort food? This combination has a way of making your day just a bit better. Come in out of the cold. (Houstonians proudly do not dress for winter.) Save your pride for dressing lightly and warm up with a hot cup of coffee and a donut before venturing out into the cold. Come in out of the heat. (9 months out of the year it’s Houston-Hot). A nice air-conditioned place to sit and cool off and enjoy a snack is always welcome on one of those steamy Houston days. Whether you’re setting off on a road trip, fishing trip, hunting trip, or setting up early for the big church event, don’t waste time making breakfast. You can catch a few more precious moments of sleep before setting off with a quick trip to one of your friendly, neighborhood 24 hour donut shops. You’ll be on your way quicker with more time left for sleep or fun. Where else are you going to go at 2 am? Let’s face it, there aren’t many places open at this hour and you may not be ready to call it a night yet! You can be more creative at night. Writers, artists and musicians all know the benefits of late night hours. A cheerful trip to the donut shop might be the fuel you need to create your next masterpiece. It’s a shop that serves donuts, 24 hours a day! Anytime is a perfect time for a donut break, and they make a great nighttime snack. Spend more time with your date. Dinner and a movie got you excited, but you aren’t ready to end the time together yet. A late-night snack and a place to talk is a perfect addition to your special night. Who knows, you may end up talking all night with that special someone. In conclusion, it’s never too late for hot fresh donuts. Whatever your reason, 24 hour donut shops are one of the most awesome places you can find. Great company, a bright, cheerful atmosphere–and donuts! Who could ask for more when you are out and about in the wee hours of the night? Never been out for donuts after dark? Drop by our 24 hour Houston location and see for yourself.